Although I am a Porsche infused diva, my other favourite brand because of the awesome people who work there is Rolls Royce. The CEO of Rolls Royce is a charm to talk to and the marketing team headed by Alaa are amazing. 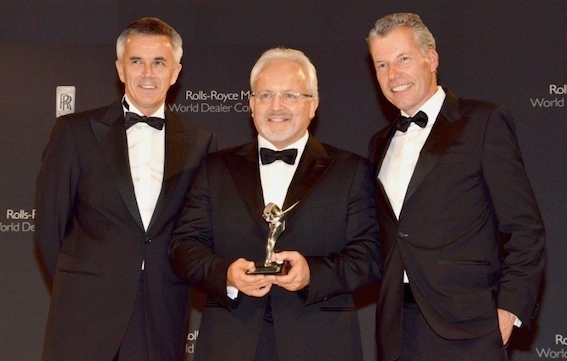 So… last month Abu Dhabi Motors, the sole Dealer for Rolls-Royce Motor Cars in Abu Dhabi and Al Ain won the Global Dealer of the Year Award for 2013 and further improved on its 2012 successes. Although I met with the team at Sheikh Zayed Road with the CEO as we toured the new workshop, the Rolls-Royce Motorcars held its annual Global Dealer Conference at the Emirates Palace Hotel for the first time in the Middle East last month. At a glittering award ceremony, Abu Dhabi Motors repeated its 2012 achievement by being awarded the Global Dealer of the Year for 2013, edging out Beverly Hills, London, Beijing and Moscow for the title as prestigious recognition of its sales and parts performance as well as high Aftersales standards. Abu Dhabi Motors achieved a sales growth of 23% over 2012 which ensured it was the Global Sales Leader of Rolls-Royce cars in 2013. In addition, Abu Dhabi Motors was honoured for being the bestselling Global Bespoke Dealer in 2013, a title it has claimed as its own for the fifth consecutive year, boasting the richest bespoke specifications and creating several unique vehicles to meet the sophisticated requirements of their customers in the UAE. Several new concepts will be finding their way to Abu Dhabi during the course of 2014 to ensure the companies successes in Bespoke will continue. The Rolls-Royce dealer Awards programme is one of the most sought after recognitions within the company and is a celebration of the brand’s successes over the past year which awards the best performing dealers for their professionalism, commitment and dedication to the brand as well as their applied systems and processes in sales and after sales. Designed to ensure top class customer experiences, improve operational standards and reward sales successes, the awards honoured Abu Dhabi Motors for the pivotal role it has played in contributing to the increasing global success of the Rolls-Royce brand….knowing the UAE team, they totally deserve it!